When it comes to applying for your student loan, international students looking to get a loan will need to find a U.S. cosigner. This video answers questions such as 'What is a Cosigner?' and walks you through the steps to finding the right cosigner and applying for a student loan. Thanks again for joining us on today’s series: Finding Financial Aid for You. 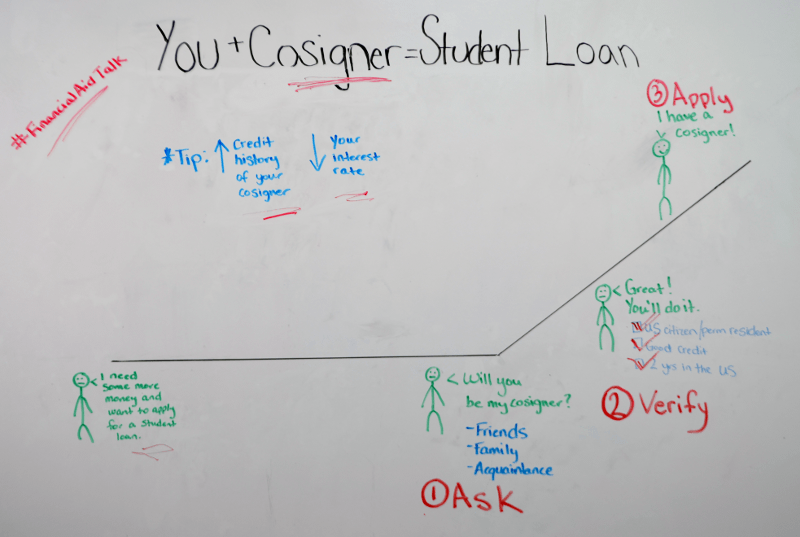 Today we are going to be talking about the US cosigner and why it’s important for international students. My name is Jennifer Frankel and I work at International Student Loan. When it comes to applying for your student loan, you’re going to have to start the process a little early to ensure you have that cosigner in place. And when you are ready to apply, take a step back and ensure you have fulfilled all of the steps. To make things a little easier, we have broken everything down into three easy steps to follow when finding a US cosigner. When searching for a cosigner, you can ask a number of people. First of all, you can ask your friends. Friends can be a great resource and will want to help when it comes to financing your education and signing onto your student loan. Family members are also great people to ask when looking for a cosigner, especially if you are going abroad to get your education. Family members may also know acquaintances that would love to be your cosigner as well. Just keep in mind that the higher the credit score your cosigner has, the lower interest rate you will have. Now realize when it comes to your US cosigner, it’s very important to remember that you are asking them to take on payments in case you can’t for some reason. This can affect their credit score and history so come prepared when asking someone to be a cosigner. Have your payment plan in mind so when can sit down and have this serious conversation you appear knowledgeable and prepared. Verification is very important when applying for student loans because these venders are going to want your cosigner to meet 3 requirements. Must be a US citizen or US resident. In other words, they must have a green card or be a US citizen. Must have good credit. Having good credit is crucial for you to get good terms on your student loan. The higher credit score your cosigner has, the better the likelihood of approval you will get for your loan. Have lived in the US for the past 2 years. Keep in mind that all lenders have these same 3 verifications, so be sure that your US cosigner meets each one. One you have made that jump and found an appropriate cosigner, you are ready to apply! Lenders will need to reach out at some point to your cosigner to go over specific details in the agreement. So when you apply for your student loan you will get specific terms and conditions back listing your interest rate (based mainly on your cosigner’s credit score and history). We hope this presentation on How to Find a Cosigner helps your financial future and we are going to continue the conversation on Twitter #financialaidtalk so feel free to ask any questions or comment on the presentation information. Otherwise, we will see you next time on Finding Financial Aid for You.